Nowadays, fairies are usually depicted as pretty little glowing winged people, associated with flowers, cute animals, and the British Isles. But the fairies that people have actually reported encountering are very different from this. Fairies are described as looking like humans, but with heights that range from three inches to seven feet tall. They usually wear clothing that befits middle or lower class people of the country and time they are encountered in, and are described as luminous, as if more light is on them than on their surroundings. Old stories of fairies never included wings; the idea of winged fairies started as an artistic motif in the 1800’s, and was helped along by a famous series of faked fairy photographs distributed in England, Europe, and the United States around 1917. Most collections of fairy lore and encounters are from the British Isles, which is why fairies are now commonly thought of as a British monster... but creatures resembling fairies are reported throughout Europe, and possibly worldwide. Fairies are said to live in a world of their own somehow next to, but separate from, our world; they have homes, families, and communities, all normally unseen and unencountered by the human world. When the two worlds meet, however, interesting ― and dangerous ― things can happen. Fairies are often invisible; even when a crowd of people are near one, a fairy may be visible only to a small number of those people... and sometimes, the fairies act as if they are unable to see the humans near them. No one is sure why this effect happens. It could be that a few humans have a special trait that allows them to see fairies (sometimes referred to as “second sight”), or perhaps the fairies can select who sees them... or some combination of both explanations. On April 30, 1973, Mary Treadgold was traveling by bus through the Highlands of Scotland. Near the town of Mull, the bus pulled over to allow oncoming traffic to pass by, and Treadgold glanced out her window at the scenery... and saw a young man only eighteen inches in height. He was frozen in the act of digging with a small shovel, as if aware he was being watched, and had a small sack by his side. His face was thin and his hair curly, and he was dressed in blue bib-and-braces with a white shirt with rolled up sleeves. His hair and shirt almost appeared to glow. Soon the bus rolled on, and he was lost to view. Interacting with fairies is tricky; it’s easy to incur their wrath by behaving in a way they feel is unacceptable... and because they can be invisible, fairies can make a person’s life very unpleasant. Because of this temper, many respectful nicknames for fairies ― such as the good folk, the wee folk, people of peace, etc. ― are employed in the British Isles when discussing these beings. This is done in the hope that the names might convince a fairy that people are speaking about someone else; at the very least, it’s hoped the nicknames might flatter any nearby fairies. A further danger of interacting with fairies is the possibility of being trapped in their world and lost to the human one. A little before 1825 in the Vale of Neath, South Wales, a man named Rhys and a man named Llewellyn were driving some horses to work when Rhys heard music that Llewellyn didn’t. Rhys wanted to see where it was coming from, and asked Llewellyn to head on to the farm. By the next morning, Rhys had still not arrived at the farm... and Llewellyn found himself being accused of murdering his comrade. 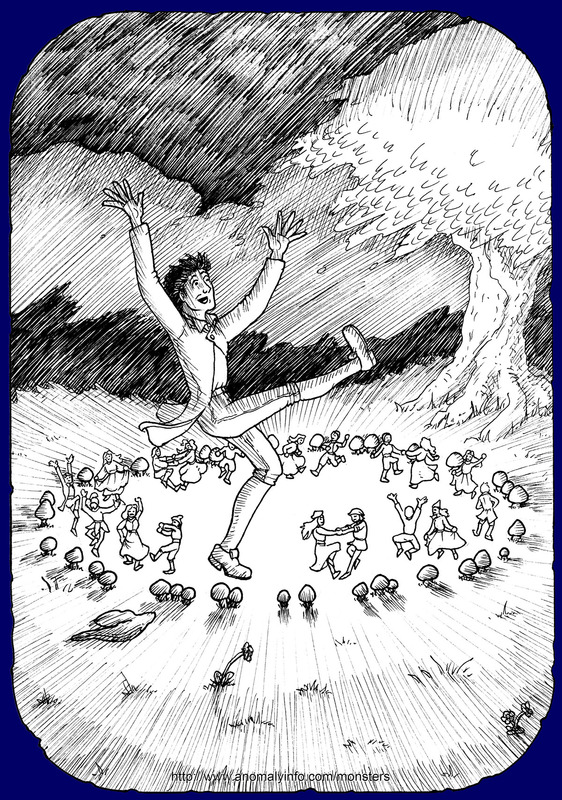 Llewellyn and some other men returned to where he had last seen Rhys; and this time, with his foot on the edge of a “fairy ring” ― a large circle of mushrooms that is said to be created by fairies ― Llewellyn also heard the music. The other men placed their feet on Llewellyn’s, which allowed them all to see Rhys invisibly dancing with a host of tiny people in the circle. Llewellyn reached in and pulled Rhys out, whereupon the fairies vanished. Rhys thought he had been dancing for just a few minutes; he became so unhappy at having to stop, he died shortly after. It is a common warning that humans visiting the fairy world must never eat or drink anything a fairy offers them; to eat fairy food will either trap you in their world, or cause you to wither and die in the human world upon returning. In 1678, a man named Dr. Moore was picked up and dragged out of a public house in Ireland by something invisible... Moore stated that a troop of men had come into the room to take him, but no one else could see them. An old woman who knew of fairies stated that she would use her magic to prevent him from consuming any fairy food, lest he return in a deathly state and pine away. Moore re-appeared the next morning, and claimed to have been carried from one fairy party to another all night long; but he never had any food because something unseen always dashed it from his hands! Not all encounters with fairies are dangerous. If humans treat fairies with respect and care, then both can get along like good neighbors should. Fairies sometimes ask for human help. It’s a good idea to do so if asked; an annoyed fairy is not a good neighbor! In the area of Ragunda, Sweden, in 1660, the wife of clergyman P. Rahm was visited by a strangely small man with a dark complexion and old gray clothes. He asked for her help with his wife, who was in labor; and, having heard of the trouble fairies can cause when upset, she agreed to go. They walked out to the gate of her house, where she felt as if they were “carried for a time along in the wind.” This odd journey brought them to a room in which the little man’s wife was lying in great pain. The clergyman’s wife helped, and soon delivered a healthy baby. She was offered food, but declined it, and was then spirited back home. The next day she found a quantity of silver on a shelf while cleaning, left as a “thank you” by the fairies. English Fairy and Other Folk Tales, by Edwin Sidney Hartland, 1890. Online: Click Here! Fairy Legends of the South of Ireland, Vol. III, by Thomas Crofton Croker, 1828 London, England. Pgs. 1-2, 215-220. Online: Click Here! Illustrations of the Fairy Mythology of a Midsummer Night's Dream, by J.O. Halliwell, 1845 London. Pgs. 292-296. Online: Click Here! Teutonic Mythology, Vol. 2, by Jacob Grimm, translated by James Steven Stallybrass, 1883 London, England. Pg. 457. Online: Click Here! Unexplained!, by Jerome Clark, 1993 Visible Ink Press, Detroit, MI, USA. ISBN: 0-8103-9436-7. pg.114-122. Online: Click Here!